Island Rep's series of New Plays and Playwrights was officially inaugurated this past weekend with a staged reading of David Rush's play "Dapples and Grays" at the Tides Playhouse in Cherry Grove. Island Rep's artistic director Richard LaFrance continues his bold season fraught with fresh new works, and his attempt to provide interesting and provocative theater for Cherry Grove is being well received by his audiences. A brief introductory note by LaFrance before the reading commenced assured the audience of exactly what they were about to experience-a view of the actual production of a play about one-third the way through the rehearsal process. As an added feature for purposes of propelling the action forward in this two-character play, LaFrance provided a third character, the Stage Manager, who read the normally unread directorial instructions, as the two actors read their lines of dialogue. The two principal characters, Father Gary Flannagin (read by Island Rep veteran Dennis Callahan) and Brian MacIntyre (read by recent "Blowing Whistles" actor Cem Uyanik), are thus joined by Stage Manager Leslie Cloninger in a work that focuses on the importance of honesty in a person's dealings with another person. Father Gary, a priest educated at Loyola University and serving in a local parish, is called upon to make a pastoral visit to a young hospitalized man (Brian) who had attempted suicide and survived the initial damage to his body with the resulting reconstructive surgery. The play begins with the reality that Brian has already died during recuperation, and the audience is brought in to witness the priest's interaction with the dying young man during his final week-long struggle, with each day being represented as a separate scene. Immediately defensive and belligerent, Brian eventually welcomes the visits of Father Gary, calling him "Pops," but as the two characters become more and more acquainted with each other, the confessional role of the priest is suddenly and surprisingly thrust upon Brian, whose recognition of Gary from an earlier sexual encounter puts the priest in panic mode and nearly destroys the level of trust that has been building between the two characters. Gary finally admits the truth of Brian's recognition and goes so far as to say that he is actually in love with Brian and is praying for the impossible-Brian's recovery and his willingness to have him join him in a life-partner relationship. It is in this moment we find the maxim, "Practice what you preach," shining through as a guiding precept. While it is true that the priest's function is to search out the sufferer's source of pain, both physical and emotional, what we discover in this play is how important it is for the priest's honesty in dealing with his own personal journey. 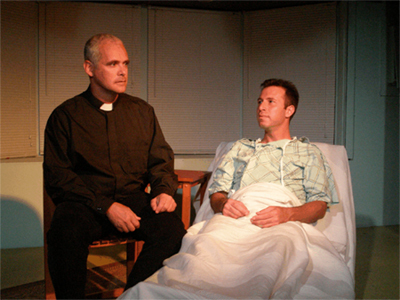 As Father Gary, Dennis Callahan, a veteran of a number of Island Rep productions, gives the audience a well-rounded exposure to the priest's own emotional journey. Attired in black shirt and clerical collar, Mr. Callahan brings poignancy and depth to the role of Father Gary, and is well cast opposite Cem Uyanik, as Brian, fresh from his successful run in Island Rep's US premiere production of "Blowing Whistles." The consummate performer, dressed only in a hospital gown and mostly bed-ridden, Mr. Uyanik's every glance and facial expression convey to the audience those feelings experienced by a dying young man. Leslie Cloninger, soon to appear in a major role in the final Island Rep production for the season, "The Dying Gaul," gives appropriate support in the "created" role of Stage Manager, clearly providing the audience with material that usually is reserved for the actors. LaFrance's direction of this staged reading continues to reveal his goal of tightness in a production, while allowing individual actors the ability to mold and express their characters. Playwright David Rush, Associate Professor of Theater at Southern Illinois University at Carbondale and Resident Writer Alumnus of Chicago Dramatists, has been well served by this weekend's reading of his play, which had been produced previously by Chicago's Stage Left Theater in 1994. His play, which deals with some extremely serious issues, is appropriately sprinkled with drama-easing humor. Rush's output as a playwright is also coupled with his importance as a teacher of play analysis, and this writer would gladly see a full production of "Dapples and Grays" with the present Island Rep cast. As a sidelight, the term "dapples and grays" refers to a line from the children's lullaby, "All the pretty little horses," which is referred to in the latter scenes of the play as part of Brian's childhood recollections.